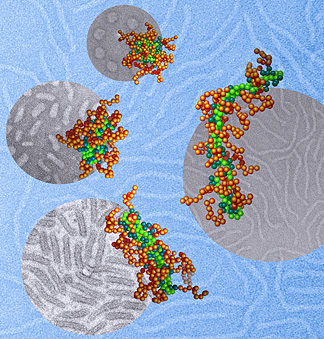 This illustration depicts DNA molecules (light green), packaged into nanoparticles by using a polymer with two different segments. One segment (teal) carries a positive charge that binds it to the DNA, and the other (brown) forms a protective coating on the particle surface. By adjusting the solvent surrounding these molecules, the Johns Hopkins and Northwestern researchers were able to control the shape of the nanoparticles. The team’s animal tests showed that a nanoparticle’s shape could dramatically affect how effectively it delivers gene therapy to the cells. The cartoon images in the foreground, obtained though computational modeling, matched closely with the gray background images, which were collected through transmission electron microscopy. Credits: Wei Qu, Northwestern University, simulation cartoons; Xuan Jiang, Johns Hopkins University, microscopic images. This study, published in the Oct. 12 online edition of Advanced Materials, is also noteworthy because this gene therapy technique does not use a virus to carry DNA into cells. Some gene therapy efforts that rely on viruses have posed health risks. “These nanoparticles could become a safer and more effective delivery vehicle for gene therapy, targeting genetic diseases, cancer and other illnesses that can be treated with gene medicine,” said Hai-Quan Mao, an associate professor of materials science and engineering in Johns Hopkins’ Whiting School of Engineering. Mao, co-corresponding author of the Advanced Materials article, has been developing nonviral nanoparticles for gene therapy for a decade. His approach involves compressing healthy snippets of DNA within protective polymer coatings. The particles are designed to deliver their genetic payload only after they have moved through the bloodstream and entered the target cells. Within the cells, the polymer degrades and releases DNA. Using this DNA as a template, the cells can produce functional proteins that combat disease. A major advance in this work is that Mao and his colleagues reported that they were able to “tune” these particles in three shapes, resembling rods, worms and spheres, which mimic the shapes and sizes of viral particles. “We could observe these shapes in the lab, but we did not fully understand why they assumed these shapes and how to control the process well,” Mao said. These questions were important because the DNA delivery system he envisions may require specific, uniform shapes. To solve this problem, Mao sought help about three years ago from colleagues at Northwestern. While Mao works in a traditional wet lab, the Northwestern researchers are experts in conducting similar experiments with powerful computer models. Erik Luijten, associate professor of materials science and engineering and of applied mathematics at Northwestern’s McCormick School of Engineering and Applied Science and co-corresponding author of the paper, led the computational analysis of the findings to determine why the nanoparticles formed into different shapes. The use of computer models allowed Luijten’s team to mimic traditional lab experiments at a far faster pace. These molecular dynamic simulations were performed on Quest, Northwestern’s high-performance computing system. The computations were so complex that some of them required 96 computer processors working simultaneously for one month. In their paper, the researchers also wanted to show the importance of particle shapes in delivering gene therapy. Team members conducted animal tests, all using the same particle materials and the same DNA. The only difference was in the shape of the particles: rods, worms and spheres. The particle shapes used in this research are formed by packaging the DNA with polymers and exposing them to various dilutions of an organic solvent. DNA’s aversion to the solvent, with the help of the team’s designed polymer, causes the nanoparticles to contract into a certain shape with a “shield” around the genetic material to protect it from being cleared by immune cells. Lead authors of the Advanced Materials paper were Wei Qu, a graduate student in Luijten’s research group at Northwestern, and Xuan Jiang, who was a doctoral student in Mao’s lab. Along with Mao and Luijten, the remaining co-authors of the paper, all from Johns Hopkins, are Deng Pan, who worked on the project as an undergraduate; Yong Ren, a postdoctoral fellow; John-Michael Williford, a biomedical engineering doctoral student; and Honggang Cui, an assistant professor in the Department of Chemical and Biomolecular Engineering. Initial funding for the research came from a seed grant provided by the Johns Hopkins Institute for NanoBioTechnology, of which Mao is an affiliate. The Johns Hopkins-Northwestern partnership research was supported by a National Institutes of Health grant. Color available of nanoparticles image; contact Phil Sneiderman or Megan Fellman.